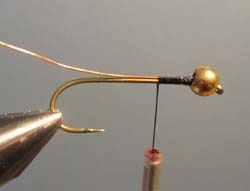 Debarb Hook, put on bead, start thread, push copper wire end under bead and wrap thread down to opposite of where barb was, holding the wire on top. 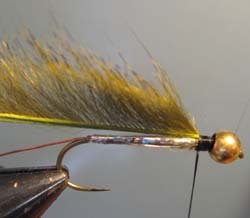 Tie in the Tinsel and take the thread in close wound wraps back to the bead. 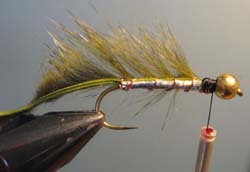 Put a smear of head cement along the thread wraps and wrap the tinsel up to the bead and tie off and cut. Wrap the rib. To start, stretch the strip and separate the fibers at the back and take a wrap of the rib around it. 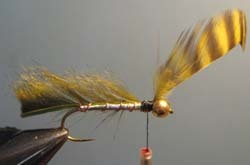 Next take a wrap of the rib around the the hook underneath the tail. 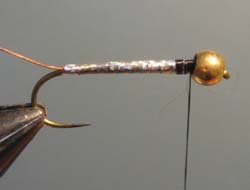 This helps anchor everthing and contributes to the durability of the fly. Now spiral the rib around the strip up to the eye, going between the fibers and each turn. 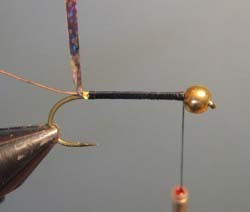 At the bead, take three turns of the rib and tie it down, and wiggle it back and forth to break it off. 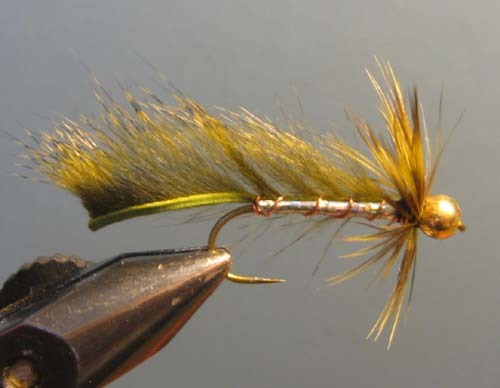 Trim the tail part of the strip to about the length of the hook shank and tie in and wrap the hackle feather.